Before I continue with Vishnu Sasharanama to complete our understanding of Vrsakapi, let me take a moment to describe my understanding till now in a jist. It is important to understand the next stanzas of VSN. Vedas are Cosmic science. There are two domains in Science. The Quantum domain of sub-atomic particles and Classical domain of atomic particles, chemical compounds and biological life. Indra (Baryons), Varuna (quark-antiquark pairs), Soma (Strong force mediated by gluons), Mitra (QGP), Apa (EM force mediated by photons), Yama (Weak force mediated by W Bosons), kAla (Higgs force mediated by Higgs Boson), Dhanada (property of Color Charge), Vrsakapi (Residual nuclear force), Vasu (nucleons) et al belong to the Quantum domain of Sub-atomic particles. Purusha (Dark matter), Shiva (Energy), Shakti (Momentum), Vishnu/Madhu (Inertia), mAyA (rest-mass), Hiranyagarbha (spacetime),Brahma (Gravity) et al belong to the classical domain in the macro world of atoms, elements and compounds. Sapta Rishis too belong to this classical world of ‘beings’. The Classical world (world of mAyA or rest-mass) evolves on top of the Quantum world (world of Suras and asuras). ‘Atma’ is the unchanging, eternal one out of which evolution comes out according to Vedic scriptures. This Atma is called Paramatma or Nirguna Brahman in vedanta. It is eternal, unchanging and beyond all our understanding. Even Nasadiya suktam says we may never know or just partially know it at all times. That evolves out of Atman is called Brahman in Vedas. The Brahman is generally referred to as saguna brahman in Vedanta. Shiva, Vishnu, Brahma, Shakti, Skanda are the evolutionary attributes of Saguna Brahman. Paramatma or Nirguna Brahman (what i called Atma) probably created the spacetime in which Saguna Brahman evolves. The spacetime is called HiranyaGarbha (inert uterus). In this HiranyaGarbha (spacetime) Shiva (Energy), Shakti (Momentum), Vishnu/Madhu (Inertia), Brahma (Gravity) evolve. From elements, to compounds and biological life, all are made of atoms which have nucleus and electrons moving at near-light speeds and possessing great momentum. This momentum is called Shakti. This momentum (shakti) of nucleus and electrons appears as ‘mass’ (mAyA) of objects to us. This is the real mAyA. Vedas are science. But vedanta is philosophy. Around science, at all times, philosophies emerge. Vedanta interpreted this mAyA (rest-mass) of vedas as ‘illusion’ in a philosophical way. The momentum (shakti) appearing as rest-mass (mAyA) is indeed illusion. But the Vedantic definition of mAyA as illusion has stuck with popular imagination, while the vedic understanding of mAyA as rest-mass lost popular appeal. The following are in perfect alignment with what science say and Vedas say. Check out. Energy (Shiva) and Momentum (Shakti) are the ones who are inside. 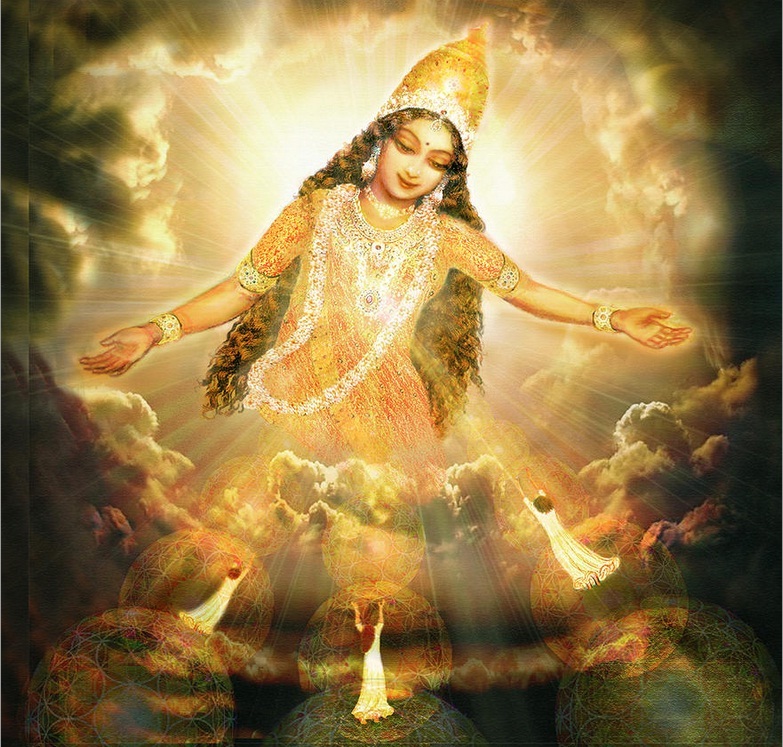 Vishnu (Inertia) and Rest-mass (mAyA) are the ones who appear to us. In all the worlds, it is energy and momentum that really exists. But that appears as inertia and mass from outside. That Energy (Shiva) or Mass (mAyA) possess both Inertia (Vishnu/Madhu) and Gravity (Brahma) is well known. That Energy (shiva) is equivalent to mAyA (mass) is also well known now. Energy (Shiva) and Momentum (Shakti) are bonded together as Ardha-Nareeswara. They are always together. They cannot be separated. But they are independent of each other. Energy and Momentum exist independently, measured independently, but always together. They are independent but together always. Hence pictured as husband-wife relationship. Mass (mAyA) is measurable while Inertia (Vishnu) is not measurable. Inertia (Vishnu) is a property of mass (mAyA). Hence Vishnu is pictured as brother of mAyA. Shiva (Energy) is pictured as Male as energy (Shiva) gets into Mass (mAyA) and causes mass (mAyA) to multiply, but does not undergo changes itself. Vishnu (Inertia) is pictured as Male as it does not undergo changes itself. mAyA (mass) and shakti (momentum) are pictured as Females as they undergo changes taking in Energy (Shiva). Spacetime is called Hiranyagarbha because spacetime is the inert uterus in which all the Universe evolves. Hiranyagarbha (spacetime) is curved at all points. Hence it is called egg-shaped. HiranyaGarbha is four-faced as spacetime is four faced, with three dimensions of space and one dimension of time. Three faces of brahma seeing three directions points to three dimensions of space. The hidden fourth face, since it is dark and hidden it is called kAlA. kAlA (kAlaHamsa) is the fourth face of Brahma. kAla means dark, destruction and time. I had mapped kAlA to Quantum Entanglement caused by Higgs force-field (Aghora Rudra). Higgs force-field could be caused by the fourth dimension of Spacetime (Hiranyagarbha). Quantum Entanglement is a property by which quantum state of particles entangle and become such that they cannot be described independent of each other. kAlA (Higgs Boson) by Quantum Entanglement couples with all particles except Electromagnetic force of Photons (ApA) and Strong Interaction of Gluons (Soma) and thereby give mass to all bosons and quarks. Those that come under the influence of kAlA (acquire mass through Quantum Entanglement with Higgs Boson), experience time. Those that do not get mass from kAlA, do not have rest-mass, travel at velocity of light (eg. photons). Those that travel at velocity of light (eg photons) do not experience ‘time’ or ‘kAlA’. Thus one that gives mass (kAlA) also gives time (kAlA). When objects travel, the rate of Quantum Entanglement happening in them may be coming down. This rate of Quantum Entanglement coming down manifests as ‘time’ slowing down with respect to an observer. When particles travel at speed of light, Quantum Entanglement is zero and time stops for those particles. This quantum entanglement continues to increase in any system left alone. It drives the increasing entropy. The increasing Quantum entanglement drives the divisions and dis-order in a stand-alone system. This increasing entropy or dis-order caused by increasing quantum entanglement of particles at quantum level causes decay (mrtyu) and destruction (antaka). Hence kAlA becomes Mrtyu and Antaka. In summary kAlA is dark because as kAlaHamsa kAla is the hidden face of Brahma. KAla is time because kAlA causes time by giving mass. kAlA is destruction/decay as it continuously increases Quantum Entanglement. Energy (Shiva) and Mass/Momentum (mAyA/shakti) affect Hiranyagarbha (spacetime). Hiranyagarbha bends down when affected by Shiva or mAyA. Hence Hiranyagarbha is called ‘Ka-ancha’ which means one who bends or inclines. Puranas call it as Brahma bending to Shiva and Shakti. The bending of spacetime due to energy and momentum (massive bodies) manifests as a pulling/attracting force towards these bodies or between these bodies. The pulling in force is large and has unlimited range. Hence it is called Brhma (the large one), the Gravity. Since Brahma, the Gravity which is caused due to bending of Hiranyagarbha, can be visualized as a force-field that runs between bodies having momentum, Brahma is said to produce a Rudra called Vamadeva Rudra. Brahma the Gravity or the bending of Hiranyagarbha to Shiva/Shakti travels like a ‘Hamsa’. Like a Swan that travels in a pond producing silent waves, Brahma, the Gravity silently produces waves on the Hiranyagarbha (spacetime), as it warps the spacetime (Hiranyagarbha) and the ‘pull’ travels from one point to another. This swan-like (Hamsa) wave movement of the Gravity (Brahma) affects all particles including the photons as photons travel along the ‘wave’ produced by the Hamsa. This ‘Swan-like’ (Hamsa) wave movement of Gravity (Brahma) may not affect gluons or carrier of Strong force (Soma) as gluons are massless, but confined in hadrons and cannot travel freely. Thus the Hamsa is said to separate the Soma (Strong force of Gluons) from the floods/Apa (EM force of Photons). In short Hamsa could be a wave or gravitational wave in specific. In the above, Higgs force-field giving mass is due to Quantum Entanglement is not proven by science. I map it to Quantum Entanglement. kAlA in trikagni-kala is the force-field that creates mass impact without participating in it. Higgs field matches it. kAlA creates the ‘mAyA’ or rest-mass. In Vedas and Puranas, mAyA is the ‘pAsA’ which ‘entangles’ and creates the mass. Basically mAyA mixes (the states of particles) in such a way that they cannot be described independently. kAlA’s pAsA produces this entanglement or mAyA. Hence I mapped kAlA, the Higgs field’s working to Quantum Entanglement. This is not yet proven. There is an emerging research field that says the Arrow of time is the increasing order of Quantum Entanglement or increasing effect of kAlA. Vedas have already described kAlA as Time. It is yet not proven fully. When ‘Brahma’ or Gravity, which is the bending of Hiranyagarbha happens, I have written this bending travels like a Swan in a pond producing silent waves around in the spacetime. Such Gravitational waves have not been detected till now.